SARAH ELIZA: IS IT WRONG THAT I FEEL CONFIDENT? Since I started primary school, I've suffered with self-esteem issues. I always felt like I was the 'big' girl of the year. Comments were made through both primary and high school about my weight. It was used as an insult in arguments and even close friends would comment on it. I don't know whether they did it maliciously or saw it was getting me down and were trying to help but sadly it didn't- it just made it worse. I grew up being more comfortable in size 18, baggy clothes. I didn't like showing any skin past my knees or past my elbows. I'd wear layers upon layers for P.E on my top half; I'd get changed in the toilets to escape embarrassment; I'd wear thick black tights all the way through summer even on the hottest day because I felt it made me look that tiny bit slimmer. There was a point when I would eat my lunch in the toilets too scared to go to the canteen in fear people would judge what I was eating. If I had a normal lunch like everyone else people would think "ew she needs to eat healthier" and if I had something like a salad people would think "aw look at that sad girl trying to lose weight and it's just not working". As gross as it was, I felt the school toilets were the only safe place I could eat my lunch; that was when my self-esteem was at it's lowest- 2013 (which I've already spoken about being the worst year of my life). Even today, I'm not comfortable getting my legs out. When on a night out with friends, while they wear these gorgeous short, sleeveless dresses, I opt for a jumpsuit with sleeves to cover all that I don't like. I think this body image I've painted of myself has aways been with me and always left me unsatisfied. However, sometimes, I'll be in the most basic of outfits maybe even my pyjamas and I'll see myself in the mirror and think "I'm not actually that bad". I'll look and see parts of myself that I actually like. I like my smile, my eyes, my hair. But then I look closer and think "no one else finds them nice so they're not". 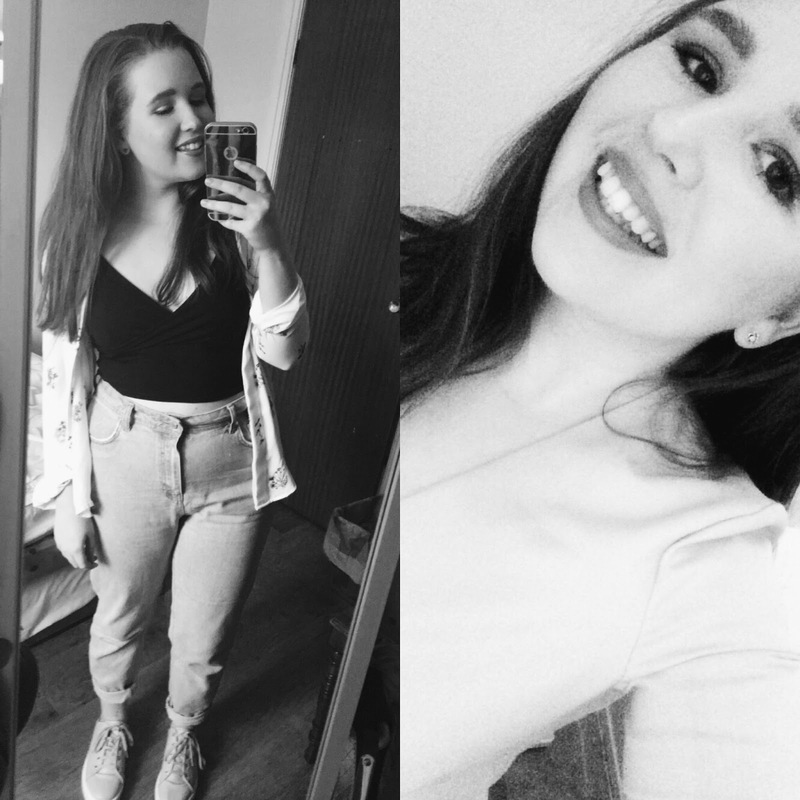 I question whether I should really be pleased with how I smile or the way my hair naturally curls when I have been ridiculed for my weight, for the state of my skin. I shouldn't feel guilty for looking in the mirror and seeing a glimmer of beauty because those that should feel guilty are those that have got me to this point. Those that constantly put me down for my size, who insinuated that it was that that held me back- they should be the ones who feel guilty. But do they even realise they made me feel this way? They probably don't remember laughing at me in primary school when we got changed for gym class or using my weight as the only insult you could conjure in an argument. While you carry on with your life, your actions have left scars on the picture I paint of myself. Over the past few months, I've come to realise that if I like me that's all that matters; I shouldn't look for people's acceptance in how I look. If I'm happy within myself, I don't for other's opinions on me. Over the past year I've become more accepting of myself and who I am and while there's still work to be done on my confidence, little things have made me proud to be me. I still won't wear shorts or skirts without tights but I feel more confident in wearing sleeveless top and even being proud to say I'm a size 12/14. It only seems small to you, but, to me, it's like taking the first steps on the moon. After one big step, another one is bound to come and I hope that comes soon as my confidence grows. It doesn't matter what people think about your appearance because the only opinion that matters is your own and if you're happy then that's all that matters.